Nehra asked to introduce Pawan Negi in the penultimate over of MI's run-chase. Royal Challengers Bangalore’s (RCB) shambolic run in this edition’s Indian Premier League (IPL) continued in yesterday’s match against the Mumbai Indians (MI) at the Wankhede Stadium in Mumbai. The franchise, captained by Virat Kohli, lost their seventh match this season and are currently languishing at the bottom of the points table with one win in eight matches. Yesterday, the Red Army had every chance of clinching a victory after the visiting team somewhat choked Rohit Sharma’s men in the death over. The Challengers scored 171 for seven in their 20 overs courtesy of a well-compiled knock of 75 runs from 51 balls with the help of six boundaries and four sixes. Moeen Ali also played a quickfire hand of 50 runs from 32 deliveries. During MI’s run-chase, Quinton de Kock and Rohit Sharma started in a blistering fashion courtesy of an opening-wicket stand of 70 from 43 balls. Nevertheless, Mumbai lost a flurry of wickets and even the required rate started creeping up to a significant extent. The spinners- Moeen Ali and Yuzvendra Chahal– came to the party and kept making inroads in the hosts batting lineup. The game went down to the last two overs when the home team needed 23 runs with Hardik Pandya on strike and Kieron Pollard at the non-striker’s end. 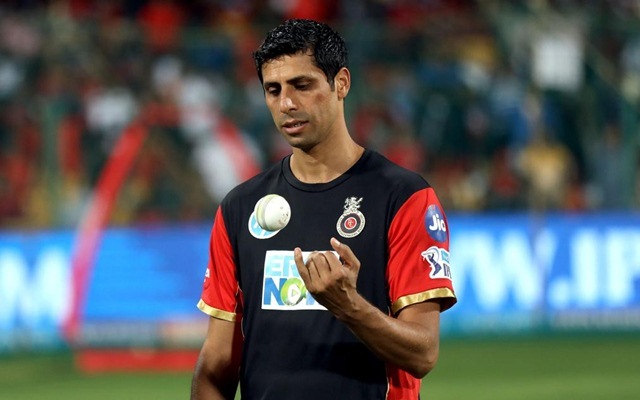 In the meantime, Ashish Nehra, the RCB bowling coach, signalled from the dugout to introduce left-arm spinner Pawan Negi into the attack ahead of speedster Navdeep Saini, who had conceded 34 runs in his first three overs. ABD from beside gave a rather confused look and walked away. The move seemed to have worked initially as Negi beat Pandya in the first ball. However, thereafter, Pandya laid into the left-arm spinner and kept finding the boundary with utter disdain. He scored those runs with six balls to spare. Subsequently, Twitter lashed out at Nehra for asking to introduce a spinner. The whole RCB structure is stupid. No better word to describe it. Har ball k baad dugout se suggestions aa rahi h, literally every ball. Field par to Jo 11 khel re h chutiye h baithe h jaise. Abe aise to gully cricket me b ni hota. PS: Ashish Nehra's always been overrated. Tough to understand why #RCB drafted Ashish Nehra as a bowling coach. He would've needed some advice yesterday, instead of suggesting the bowlers what to do. What drama!